When your heart isn't getting enough oxygen you may experience chest pain or discomfort called angina pectoris. Angina (an-gin-ah), or angina (an-jye-nah) as it is sometimes called, is a serious condition. But there are steps you can take to manage it and continue enjoying your life. Men and women may experience angina symptoms differently, but for both it often starts as an aching, tightening or squeezing discomfort in the chest that may spread to the neck, jaw, arms or back. Other symptoms of angina can include sweating, shortness of breath, fatigue, indigestion, and nausea. To better understand angina, let's take a look at the heart. The heart is a muscle which continuously pumps blood throughout the body. To do its job, the heart needs oxygen and nutrients. These are supplied by large blood vessels called coronary arteries. The harder and faster the heart pumps, the more oxygen-rich blood it needs. The main cause of angina is coronary artery disease. Coronary artery disease develops when fatty deposits, called plaque, build up on the walls of the coronary arteries. As it progresses, plaque can partially block the coronary arteries and less blood gets to the heart. Without enough oxygen-rich blood angina symptoms, like chest discomfort and chest pressure or tightness, can occur. If the disease continues to progress, blood clots or plaque can completely block the artery and a heart attack can occur. Heart disease is the leading cause of death for both men and women. 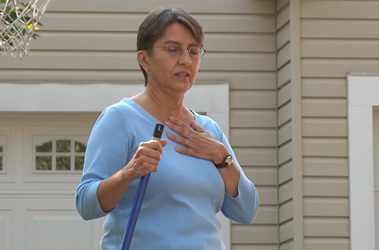 When you have angina, you may notice that certain activities trigger your angina symptoms. Recognizing triggers and symptoms is important. What activities and conditions trigger your angina? What symptoms do you have? How long does an episode of angina last? What do you do to relieve an episode? You should write down this information along with anything else you think may be important and discuss them with your healthcare provider. This can help you take steps to reduce and avoid angina episodes and keep track of changes in your condition. A sudden change in the pattern of your angina or angina which occurs without any cause or trigger could signal unstable angina, and needs to be checked right away. Otherwise, it can quickly lead to a heart attack which can cause permanent heart damage. Alert your healthcare team immediately if you notice symptoms suddenly changing or getting worse, an episode that lasts longer than usual, or one that cannot be relieved. Never be afraid to call 911, if you feel your angina is getting worse or if you think you may be having a heart attack. "I think it's important to make note of things that aren't right. If you're not feeling well, seek some medical aid."